ESPN College Gameday was in Missouri today and history went down before the game even started. Rece Davis asked Missouri’s Kim English and Mike Dixon who their celebrity crush was. Typically you expect these athletes to throw out names like Hallie Berry, Kim Kardashian, or if you want to keep it in the sports world Erin Andrews. Well not Mike Dixon, he has a different taste unlike anyone else. 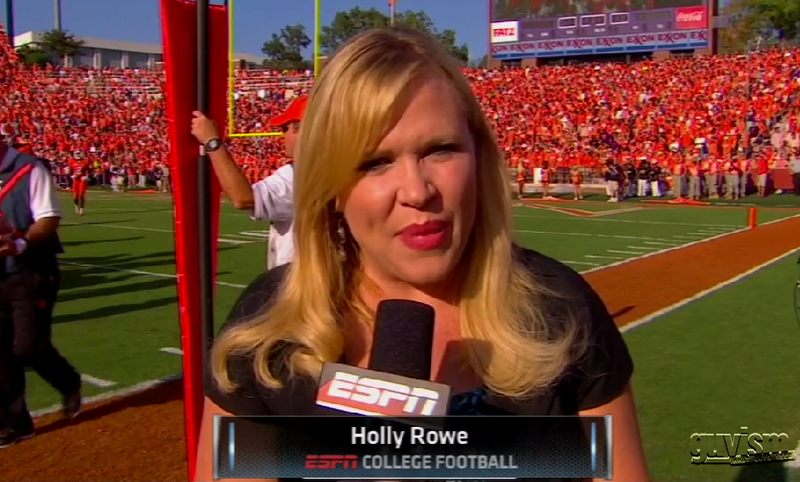 He responded with, which was correctly guessed by English, “Holly Rowe“. This has to be the first documented instance in which a man, on National Television, declared that at the top of his Hump Island is none other than ESPN sideline reporter Holly Rowe. What makes this even more shocking is that this isn’t just something that he came up with at the last second. Kim English guessed that he would say Holly Rowe so that means on more than one occasion Dixon has talked about how he wants to practice making babies with Holly Rowe. Holly Rowe does a fine job on the sidelines but in the looks department she is no Erin Andrews. She’s also no Jenn Brown, Jill Arrington, Michelle Beadle, Hannah Storm, Stacey Dales, Linda Kohn, or even Dana Jacobsen. But that’s OK because according to Mike Dixon she is number one in his eyes!